Dr. Marvin ‘Doc’ Cheatham calls for the removal of a monument to Confederate generals Robert E. Lee and Stonewall Jackson located in Wyman Park at a press conference on June 30. A coalition of citizens is calling on the city to remove a monument honoring two Confederate generals located in Wyman Park, saying the two fought to preserve racism and slavery and that the statue sends the wrong message in a city that has long struggled with race relations. Led by Dr. Marvin ‘Doc’ Cheatham, president of the Matthew A. Henson Development Corporation (f.k.a. 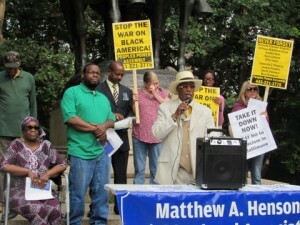 Matthew A. Henson Neighborhood Association), supporters of the monument’s removal held a press conference in front of the statue, whose base lauds Robert E. Lee and Stonewall Jackson as two “great generals and Christian soldiers” who “waged war like gentleman,” on June 30. 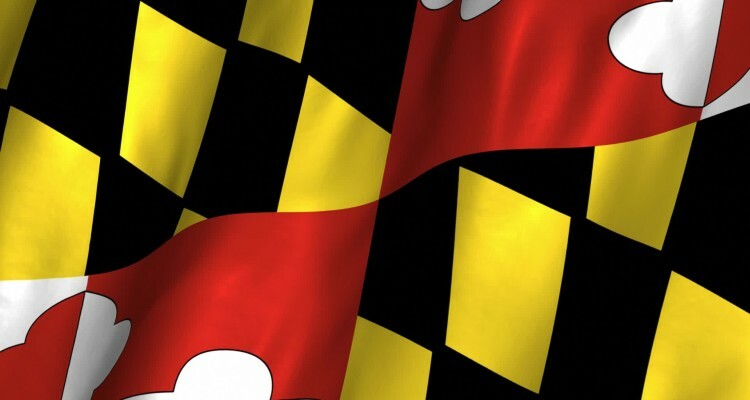 “We are asking today, the mayor of the city of Baltimore, and the Baltimore City Council, to follow the same [direction] they purportedly are moving in as it relates to Robert E. Lee Park, that’s in Baltimore County, that the city owns,” said Cheatham, referring to the Baltimore County park the council has moved to rename in the aftermath of the Charleston shooting at Mother Emanuel AME Church and at the behest of county executive Kevin Kamenetz. Doni Glover, founder and CEO of DMGlobal Communications, also spoke at the press conference, addressing the inscription on the base of the statue referring to the generals’ Christianity. “I don’t know what God they praised, and I don’t know what Jesus they looked at, but our God does not endorse slavery of anybody,” said Glover, who also called for a monument to Harriet Tubman as an alternative to those honoring Confederate icons. 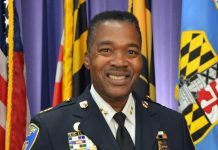 Prior to the holding of the press conference, and perhaps in response to Cheatham’s announcement of it, Baltimore City Mayor Stephanie Rawlings-Blake announced the appointment of a commission to review all Confederate statues in the city and make recommendations as to what should be done with them. Baltimore City Councilwoman Mary Pat Clarke attended and spoke at the press conference, saying she believed the mayor’s actions were in response to Cheatham’s efforts and calling those efforts a conversation starter. 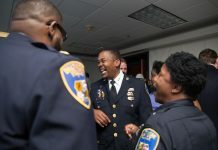 “Ever since [Cheatham] began this idea of coming here today, I have been supportive because now it will lead to the conversation [about race relations] we all keep telling each other we need to have in this city,” said Clarke. Debates about the appropriateness of Confederate symbols and monuments in public spaces have been occurring throughout the country in the aftermath of the Charleston shooting, and some in support of retaining the symbols have argued that they are historical, not ideological (i.e. racist), in nature. Local activist Mark Hughes addressed this argument in his comments during the press conference.